grants in Hong Kong and discuss the cross-cultural identity formed by linguistic practice. speakers of different languages, Thomason & Kaufman, 1988). identity are closely correlated, and cannot be studied separately. vestigated the socio-cultural status of Cantonese and English. (Bolton & Luke, 1999; Pennington, 1998). land groups in Hong Kong. relevant socio-cultural phenomena in Hong Kong. the use of two language varieties within a single social setting. colloquial items in Putonghua sentences. ever necessary or suitable in conversational settings. ing or elaborating examples of Cantonese words or sentences. conducted for transcription and discourse analysis. were analyzed from these five aspects of linguistic practice. 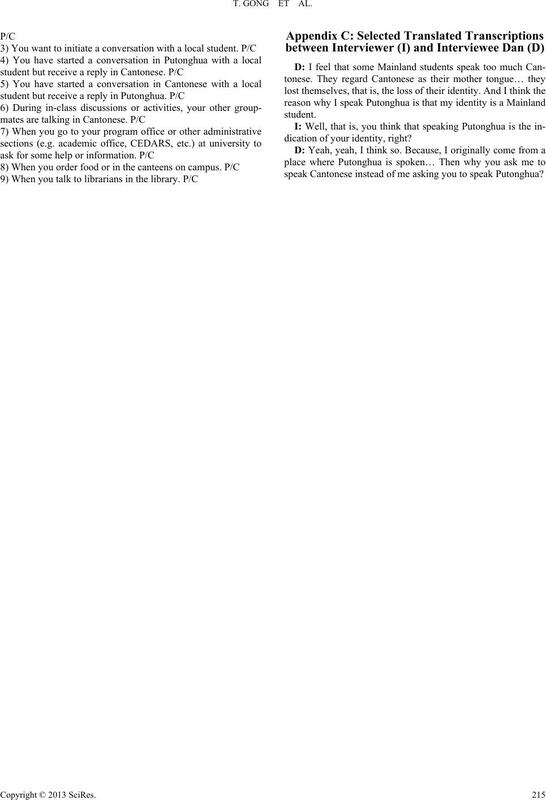 ences were excerpted from transcriptions. could clearly distinguish them from those of Putonghua. other reasons also contributed to such code-mixing. tonghua or Cantonese in a particular situation. the corresponding Putonghua expressions and English translations. participants who select a particular reason for code-mixing. that in the semesters without such course. able, hard-working, efficient, and shared similar learning styles. participants already knew some Mainland students in the class. local students in the class, either type of students would be fine. ticipants who select a particular aspect in Cantonese. sense of isolation and otherness. being more Mainland-like, and the other being more localized. Detailed analysis of this is shown in the next section. 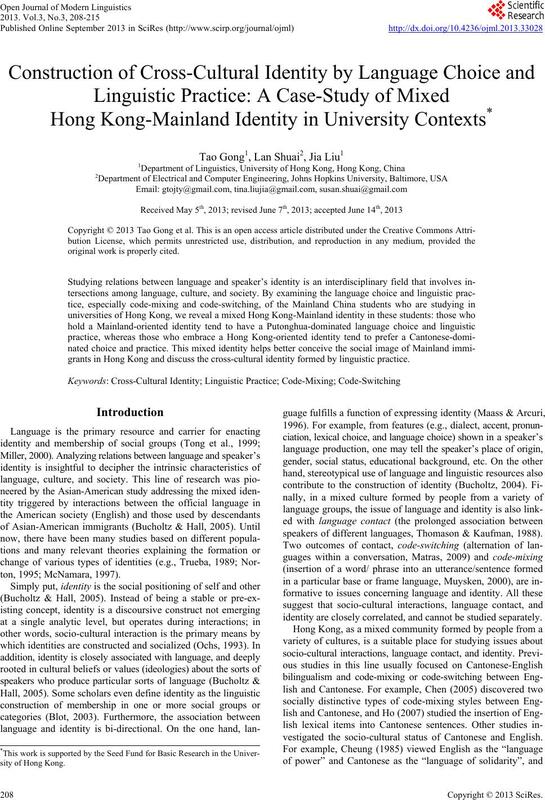 identities by both linguistic and non-linguistic practice. either Mainlanders or Hong Kong people. social difference” (p. 132, see also Irvine, 2001). tiating between these two groups. toward either type that matters. 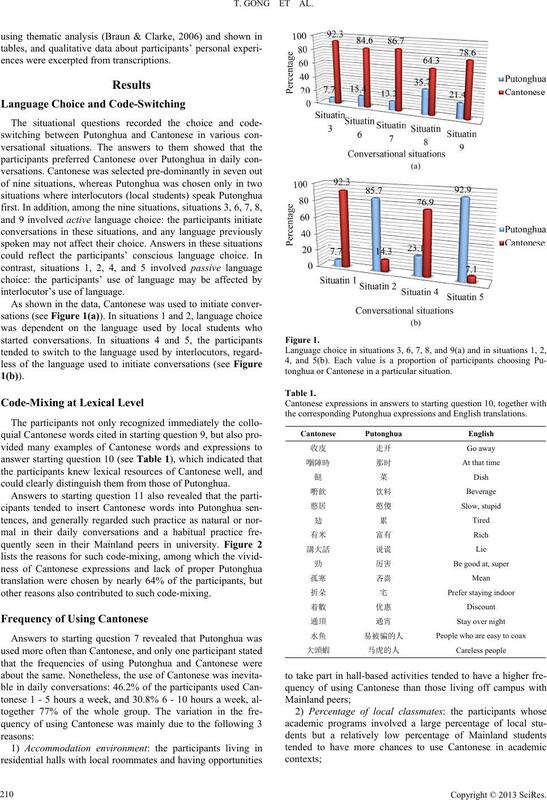 tonese over Putonghua in most interactional situations provided. willing to work with local students when doing group tasks. Blot, R. K. (2003). Language and social identity. London: Praeger. of Hong Kong, Social Sciences Research Centre. Braun, V., & Clarke, V. (2006). Using thematic analysis in psychology. 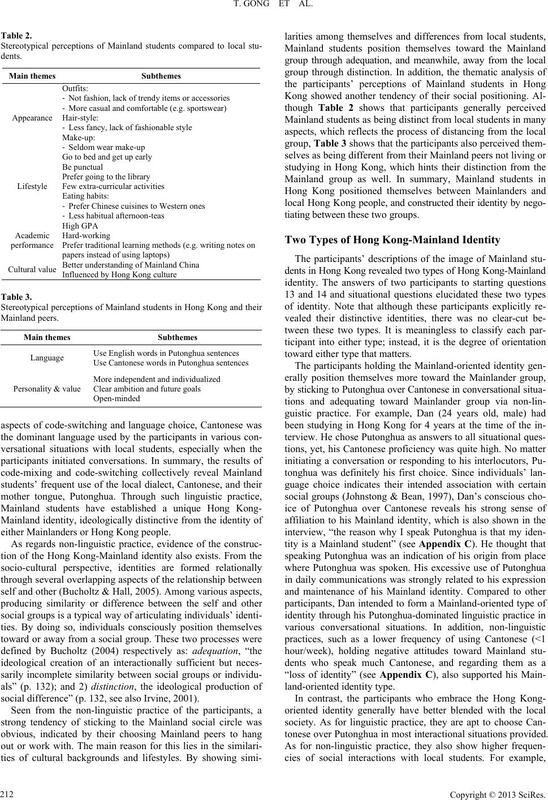 Qualitative Research in Psychology, 3, 77-101.
of identity among Laotian American youth. Pragmatics, 14, 127-147.
tural linguistic approach. 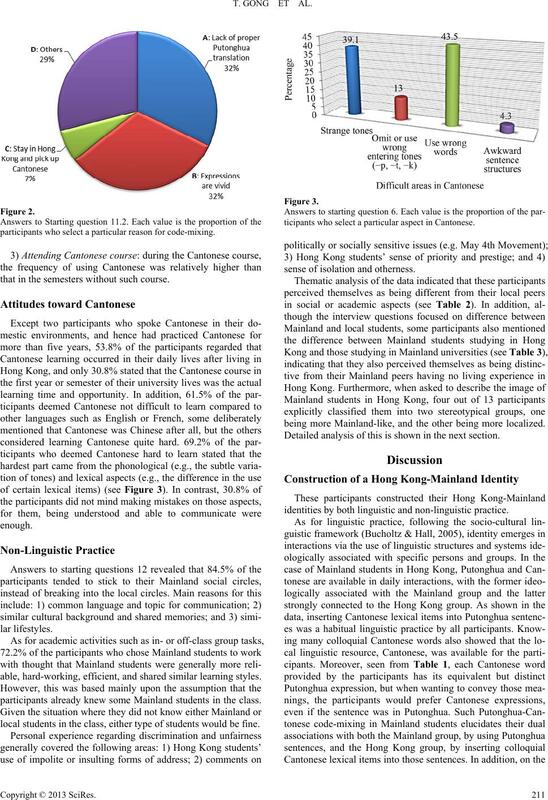 Discourse Studies, 7, 585-614.
styles in Hong Kong. In J. Cohen, K. T. McAlister, K. Rolstad, & J.
bilingualism (pp. 527-541). Somerville, MA: Cascadilla Press. sociolinguistic study. Anthropological Linguistics, 27, 190-203.
variation. 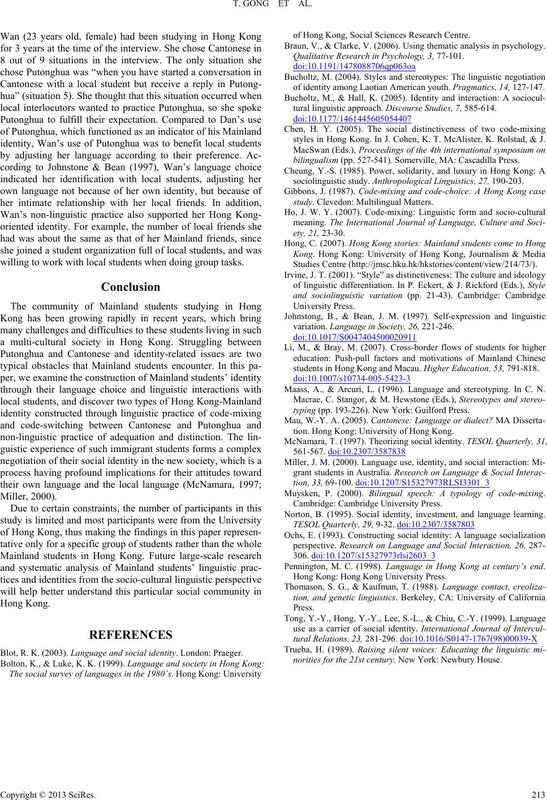 Language in Society, 26, 221-246.
students in Hong Kong and Macau. Higher Education, 53, 791-818. Maass, A., & Arcuri, L. (1996). Language and stereotyping. In C. N.
typing (pp. 193-226). New York: Guilford Press. tion. Hong Kong: University of Hong Kong. Muysken, P. (2000). Bilingual speech: A typology of code-mixing. Norton, B. (1995). Social identity, investment, and language learning. Pennington, M. C. (1998). Language in Hong Kong at century’s end. Hong Kong: Hong Kong University Press. norities for the 21st century. New York: Newbury House. stepping-stone for international development (Li & Bray, 2007). students in Hong Kong are various problems and challenges. emotional security and loss of identity. 2) How long have you studied Cantonese? 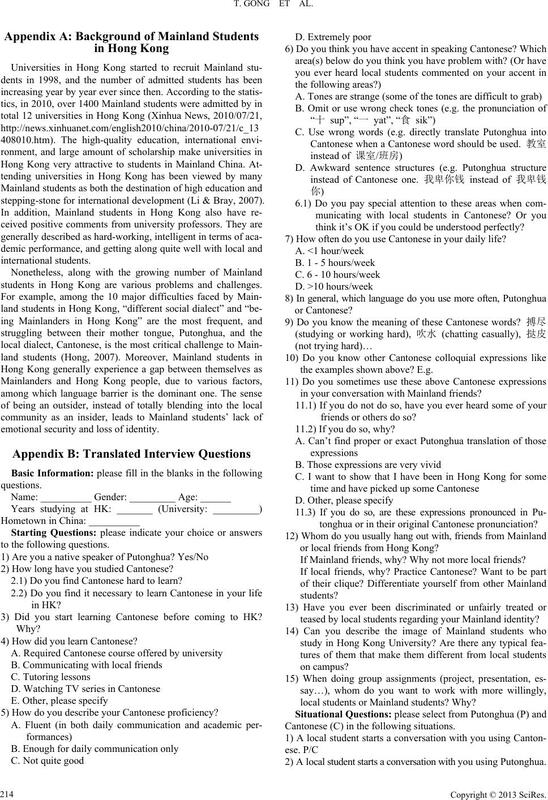 2.1) Do you find Cantonese hard to learn? 3) Did you start learning Cantonese before coming to HK? 4) How did you learn Cantonese? 5) How do you describe your Cantonese proficiency? think it’s OK if you could be understood perfectly? 7) How often do you use Cantonese in your daily life? the examples shown above? E.g. in your conversation with Mainland friends? friends or others do so? 11.2) If you do so, why? tonghua or in their original Cantonese pronunciation? or local friends from Hong Kong? If Mainland friends, why? Why not more local friends? teased by local students regarding your Mainland identity? local students or Mainland students? Why? Cantonese (C) in the following situations. 2) A local student starts a conversation with you using Putonghua. dication of your identity, right? speak Cantonese instead of me asking you to speak Putonghua?